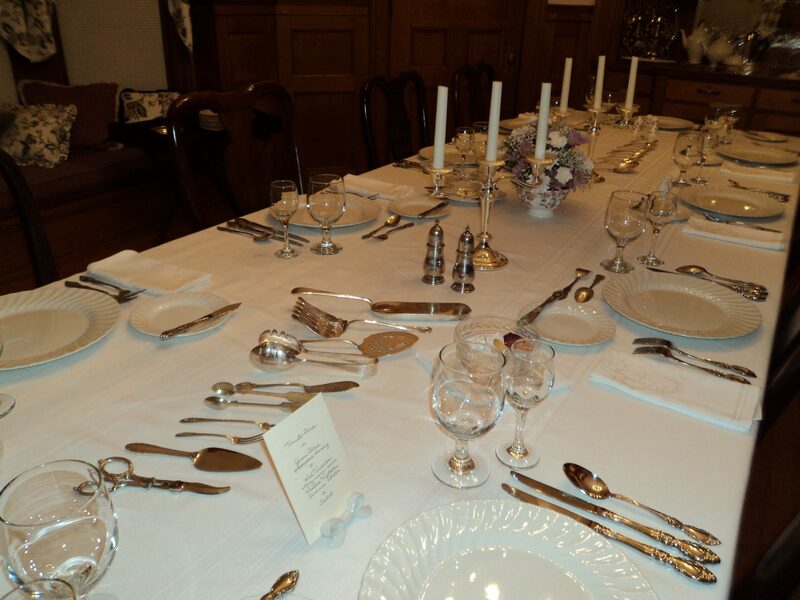 We arrive into the dining room to find the table set for dinner. But tonight not all the place settings match. Sometimes it is fun and perfectly acceptable to use a variety of different china patterns and other things to make the table interesting. Here the china matches, but the differences are in the settings since I am illustrating several ways things might be done. The decorations include a flower arrangement flanked with candelabra and lines of cutlery which will become a classroom as guests try to name the pieces like a good footman doing his homework. Still standing because the hostess is still standing as she wants everyone to be able to see each place setting, we note some differences. Some cutlery is upside down. Some place settings have spoons and forks at the top of the plate, some small salt and pepper shakers. One person has a menu. It will all become clear. We do not touch the table. We do not touch anything on the table. We do not put anything on the table. A small purse may go on your lap; anything larger that has found itself here in the dining room should be left on the floor. Handkerchiefs, tissues and pill bottles should not even be seen. Cell phones and other modern electronic paraphernalia have no place in the room. Nothing on the table should be rearranged at any time and, with a very few exceptions which I will eventually mention, we never touch anything other than the napkins, silverware, and glasses. To sit, you move to the right, pull out your chair, and sit to the left. A man may certainly hold the chair for a woman if he chooses, in which case, he should take care to push it in gently and not too far. You sit squarely on the chair with both feet flat on the floor, leaving a small space between your front and the table and a small space between your back and the chair back. You should not touch the chair back except between courses after the main course. This requires good posture. In a number of movies good posture, or the lack of it, effectively helps to identify the gentility of the characters. You should not move the chair after it is in place and all four chair legs should remain on the floor. You should not touch your face or head or wriggle around in any way. In a nutshell, hands belong in your lap and your attention belongs on the party. Napkins come in many sizes. We are using damask luncheon napkins which are twelve to fourteen inches square. Dinner napkins are much larger, may be thirty inches square. They are folded and placed to the left of the forks. When the first course is not on the table as you arrive, your napkin may be placed across your plate or folded into an elaborate shape in the center of the plate. When the hostess places her napkin on her lap, that’s your signal to do the same. A napkin should never be tucked into your shirt; it belongs on your lap. The idea is to do it discretely, without flourish; just slip it off the table and down to your lap. It should be opened until it is still folded in half and placed flat on your lap with the folded edge closest to you and the open side toward your knees. All napkins are used this way with the exception of very small tea napkins which may be fully opened, but may also be left folded in half which is my preference. The idea is that you may easily reach down and pick up the center of the napkin on your lap to use it and then replace it without having to call attention to the process. There was a time when family members in many households reused their napkins and they were pulled into napkin rings to identify the users. Nowadays decorative napkin rings are sometimes used and they should be placed on the table to the left of your place setting when the napkin has been removed. All guests should finish each course at the same time. It is the job of the hostess to help make this happen. If you find that your plate is always empty when everyone else is only half-finished, then you should consider slowing the pace a little. If you find that everyone else is usually finished long before you are, you should do the opposite. An experienced hostess will slow down herself when she notices that you are not finished. The footman will not touch any plates until he sees the hostess place her knife and fork in the finished position. The hostess will try to dawdle along until you are finished, but if you see her indicate that she is finished, you are then finished as well and you should immediately put down your knife and fork. 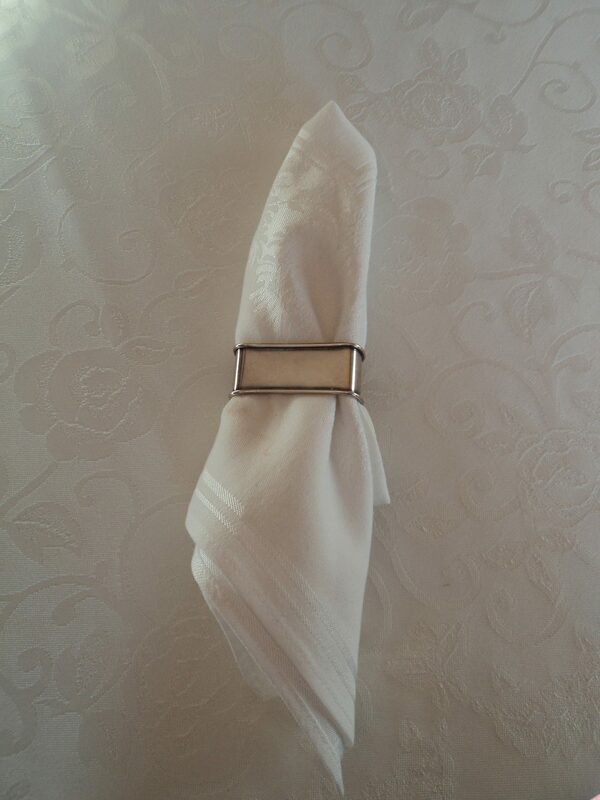 A napkin is pulled through the napkin ring, not rolled or folded.